During the past two or three years, I've written several--well, more than several--articles for LinkedIn that I often, but not always, simultaneously published on Medium and Casetext. Many of these articles are law-related. 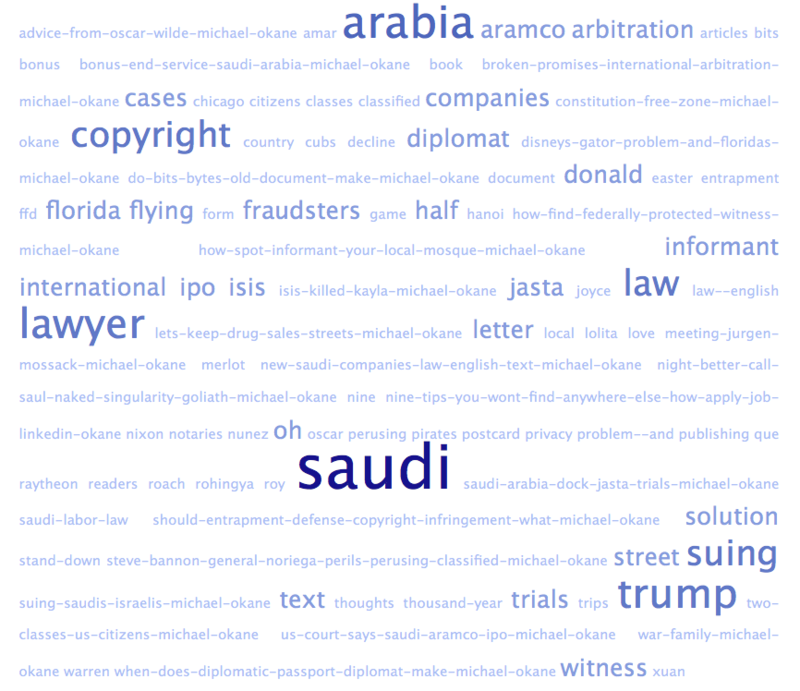 The subjects range from Saudi legal matters to copyright, with a few book and movie reviews thrown in for good measure. The story about James Joyce's flight from Nazi-occupied France and his refusal to accept a passport from a neutral country that would have permitted easy travel led to an interesting e-mail exchange with a relative of Joyce's wife Nora. The articles warning of collateral consequences to the proposed Saudi Aramco IPO led to multiple insistent, stalking-like telephone calls from a Wall Street Journal reporter who was upset that I would not be a source for him. The articles speak for themselves. I wrote that he could feel free to quote from them with attribution, but that wasn't enough. I wish I had the time to update all the articles. The Star Trek Axanar litigation was settled obviating a judicial pronouncement on whether a copyright oral license is valid (I believe it is). The Kerouac Estate's shenanigans (a Florida court found that the current Executor exercises powers under a fraudulent testament) will stay on the backburner because the Kerouac Estate wisely settled with the Casady Estate in the "Joan Anderson Letter" litigation. The warning in the article "Parallel Lines" has fortunately not proven accurate. The current U.S. president answers not to history, but to himself. If he had a messianic streak, the world would be doomed. The list of articles with links can be found below. All of these are links to the Articles on LinkedIn. The articles can also be found on this site on the blog. U.S. Court Says "No" to Aramco IPO? Should Entrapment be a Defense to Copyright Infringement? Saudi Arabia: Time for a Safety Stand-Down? When does a Diplomatic Passport not a Diplomat Make? Do Bits and Bytes an Old Document Make? Martha Stewart and Cecil the Lion: What Links these Cases?